The CannaDx™ sensor will allow you to test your cannabis potency (% THC) on site and within a matter of minutes, but this proprietary sensor goes even beyond that. 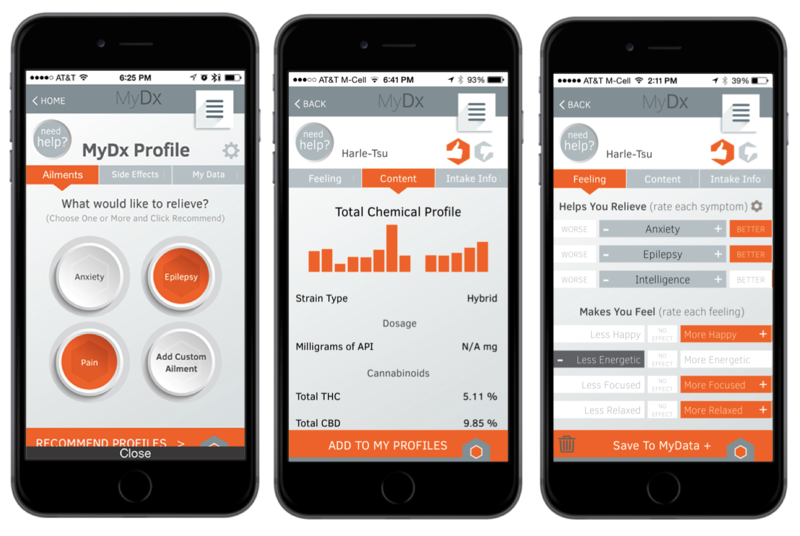 CannaDx™ detects other cannabinoids (such as CBD and CBN) as well as 20+ terpenes, providing you with a Total Canna Profile™ (TCP) – or a more comprehensive chemical analysis of your cannabis. These raw numbers are then matched against our lab tested chemical database and crowdsourced consumer feedback to provide you with a prediction of how this cannabis might make you feel and what symptoms it has been reported to potentially alleviate by other MyDx users. Using this track and predict feature will allow you to find a strain, or a Total Canna Profile™, that works for you. As seen in the video below, MyDx™ introduces an extremely easy and convenient method for cannabis testing. Our ultimate goal is to empower the industry. We do so by providing the easiest-to-use and most reliable portable cannabis analyzer. This gives manufacturers, distributors, regulators, and consumers the information they need to make smarter decisions about their cannabis. In doing so, we hope to establish cannabis as a legitimate medicine as well as to help legitimize the industry as a whole. We strive for scientific coherency, accuracy, and transparency. Cannabis contains over 400 compounds including cannabinoids, flavonoids, terpenes, fatty acids, and more, all with potential medical uses. These compounds work together to create an Entourage Effect – the total physiological effects resulting from a particular strain. This Entourage Effect is a direct result of the chemical composition of the cannabis in question. A Total Canna Profile™ (TCP) is a more comprehensive view of the majority of the chemical components, and therefore knowing the TCP and tracking the TCP effects allows users to more reliably predict the physiological impact of cannabis on their minds and bodies. 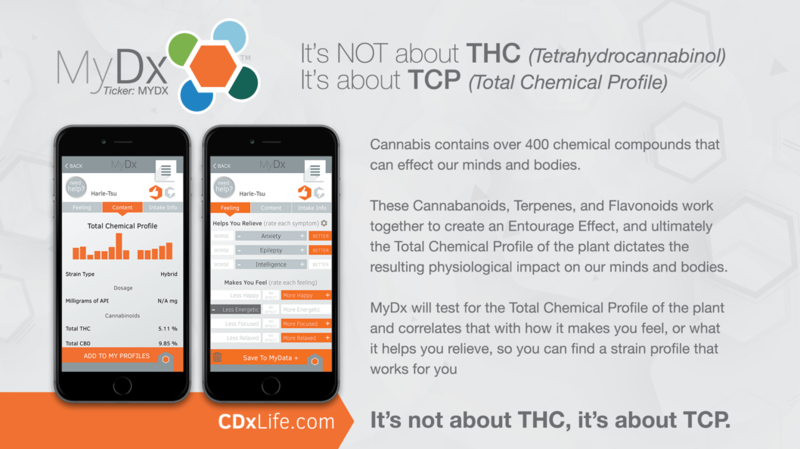 The MyDx Total Canna Profile™ (TCP) is a proprietary cannabis index based on a set of algorithms and associated data resulting from using the MyDx handheld analyzer and mobile app. The TCP is essentially a summary of the cannabinoids and terpenes and other compounds detected by our sensor. It’s like a unique fingerprint. The TCP provides a user with the ability to find a cannabis strain that works for them and correlate it with a desired effect, whether that be symptom relief or simply how it makes them feel. “What Symptoms Will This Sample Help Me Relieve? Cannabinoids, such as tetrahydrocannabinol (THC) and cannabidiol (CBD), are molecules that target receptors found throughout the body providing relief to an array of symptoms including pain, nausea, and inflammation. 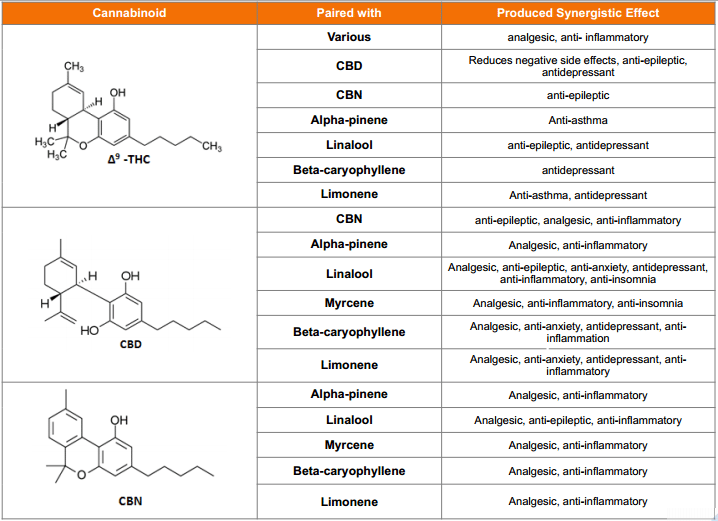 The principal cannabinoids found in cannabis are THC, CBD, and cannabinol (CBN). It is important to note that many other relevant cannabinoids such as THCv, which has been reported as an appetite suppressant, as compared to THC, which is typically reported as an appetite stimulant, are very much relevant and might be reflected in our TCP sensor response. However, we do not at this time report a THCv values in our system as part of the TCP report. 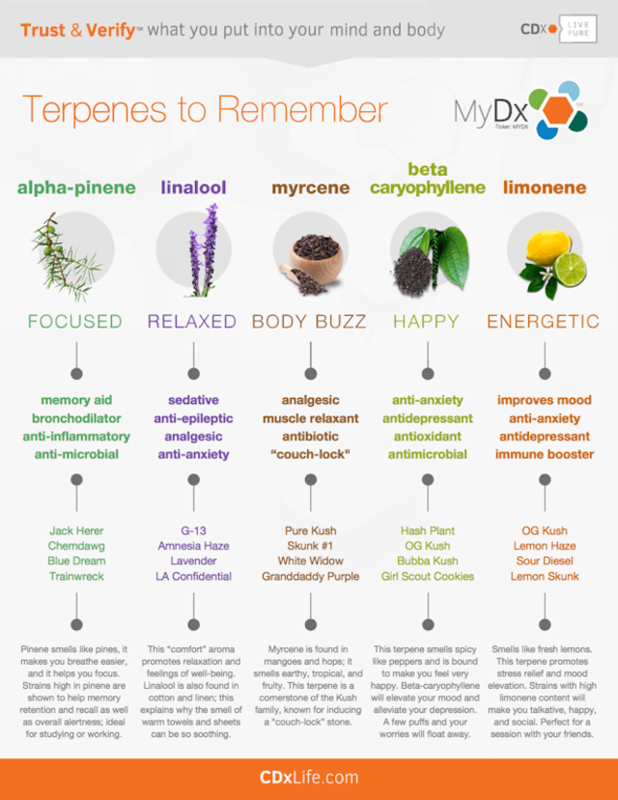 Terpenes are what give cannabis its amazingly complex taste and smell. Without terpenes, cannabis would be very bland because THC and other cannabinoids have no distinguishable odor or taste. Alpha-pinene, myrcene, limonene, and linalool may not roll off the tongue, but their sensory descriptors like piney, musky, fruity, tropical, spicy, floral, and citrusy immediately conjure up memories of familiar tastes and aromas. It’s then no surprise to learn that terpenes aren’t unique to cannabis – they can be found in everything from plants and herbs to fruits and spices. 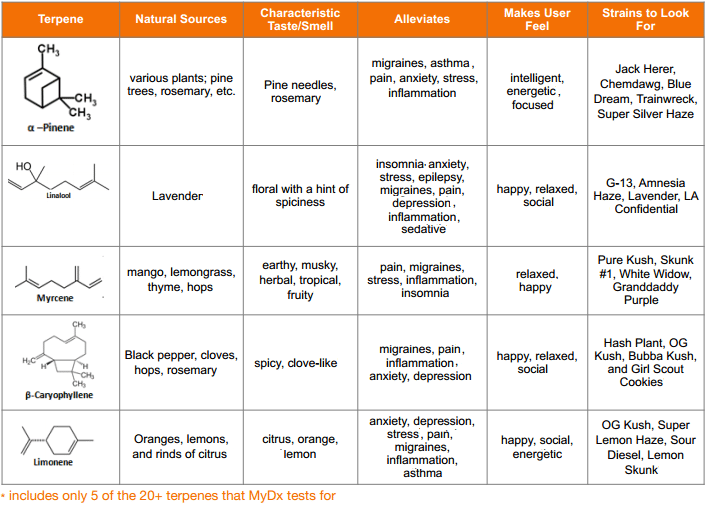 Terpenes are an important component to the overall cannabis experience, not only influencing a strain’s taste and smell but also influencing its effects on the body (summarized in the table below). The total medicinal effect of all of the components in cannabis is referred to as the “entourage effect”. This documented phenomenon is what distinguishes one strain from another, and research shows it relies heavily on the physiological effects produced by terpenes. Sometimes you just find a strain that totally works for you. It’s all about the right ratio of terpenes and cannabinoids and the entourage effects that ratio produces. The result is a unique cannabis experience that essentially distinguishes the wide variety of strains (and their chemotypes). Clearly, the entourage effect should not be underestimated. Research shows that these synergistic effects lead to three to four times the medical efficacy; meaning a full cannabis extract will be three to four times as effective as a THC-only extract. Synergistic compounds also help mitigate some of the negative side effects of the primary constituents, THC in this case. When all of these variables are analyzed in the context of the data contained within a TCP, users experience a new way of consuming cannabis. Cannabis 2.0, wherein the user can directly track, predict, and record the effectiveness of a strain (or TCP) depending on their own specific needs. Essentially, this is cannabis tailored to the users’ needs. 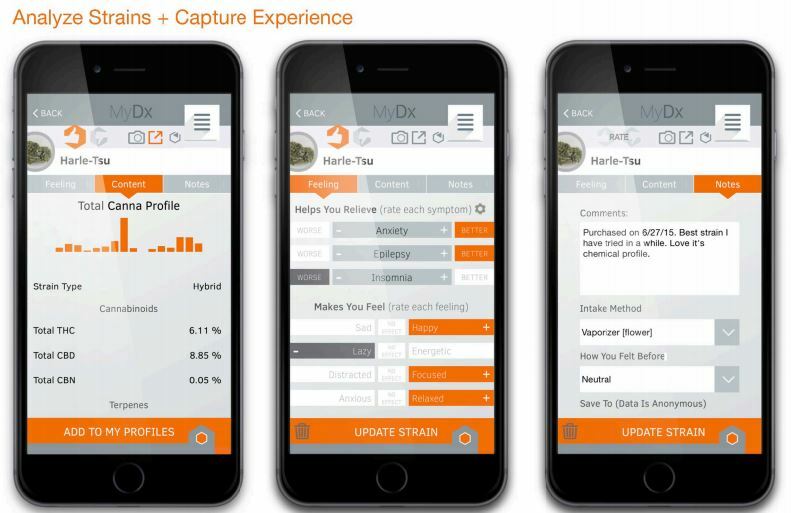 In order to help users get their desired cannabis experience MyDx utilizes all of this information to relate cannabinoid and terpenes content into feelings and symptom relief. The two tables below summarize these findings. 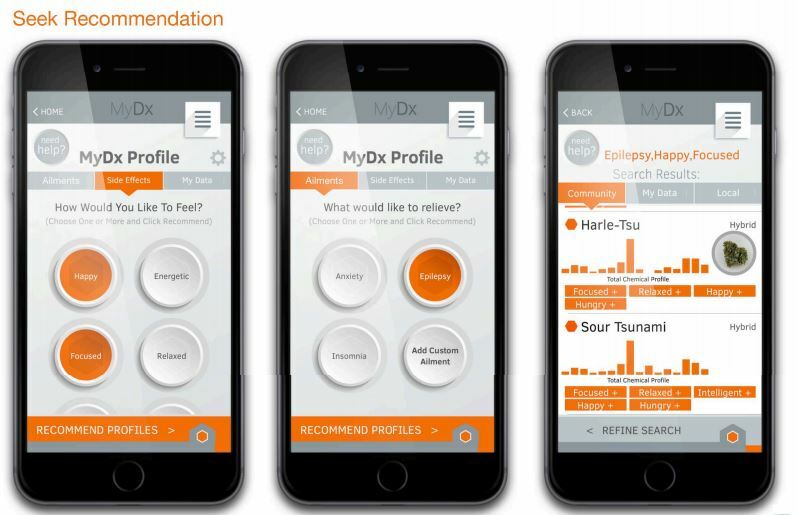 MyDx leverages the data above, a HIPPA compliant and secured crowd-sourced database, the resulting TCP, and proprietary algorithms to relate the concentrations measured into how that strain might make users feel and what symptoms it can potentially relieve. As the crowd-sourced database grows, so will MyDx’s ability to relate TCPs to users’ experiences. 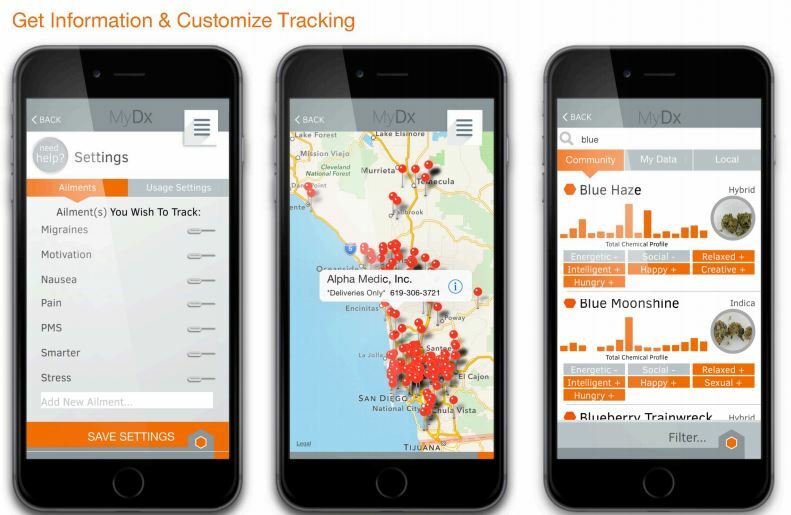 Similarly, the more a user tests and tracks their experiences the better MyDx will become at predicting the characteristics of future cannabis samples. By finding similar TCPs, MyDx allows users to more consistently find strains that deliver their desired effects. 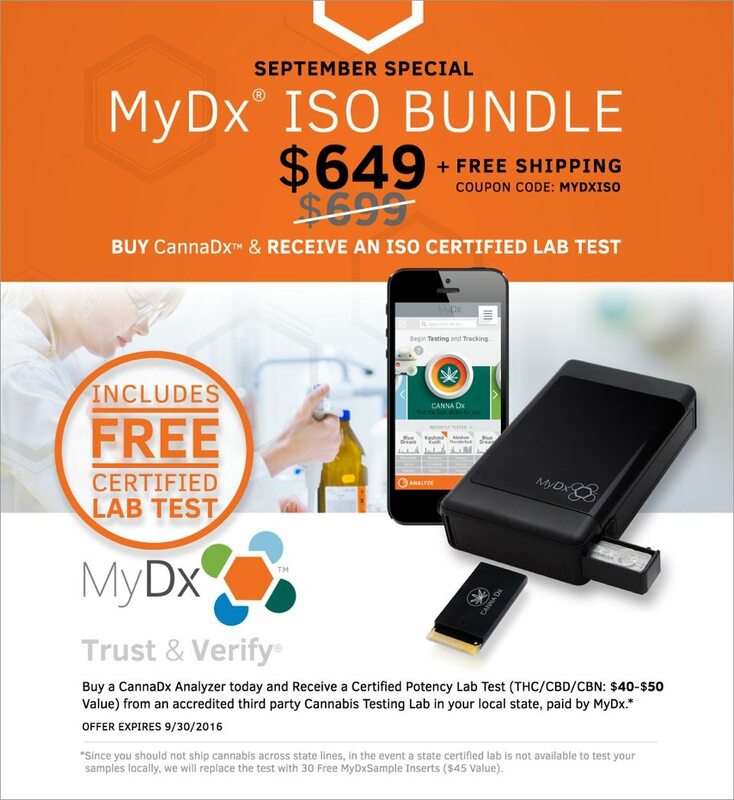 MyDx offers four main features to users: the ability to analyze cannabis samples for a TCP, to track how that TCP affected them, to seek similar TCPs to ones that worked for them, and to get information on where to find those strains, or TCPs, that delivered the experience they desire. The App screenshots below highlight these features. MyDx provides the entire cannabis industry with the tools and knowledge needed to truly get the most out of their cannabis. We aim to bring manufacturers, distributors, consumers, and regulators together under a common goal of transparency, consistency, and reliability. * DISCLAIMER: IT IS IMPORTANT FOR CONSUMERS TO BE ADVISED THAT ANY CLAIMS REGARDING THE MEDICAL BENEFITS OF CANNABIS ARE STILL UNDER RESEARCH AND UNTIL APPROVED BY THE FDA OR ANY OTHER RELEVANT INTERNATIONAL REGULATORY BODY, ARE CONSIDERED ANECDOTAL IN NATURE.